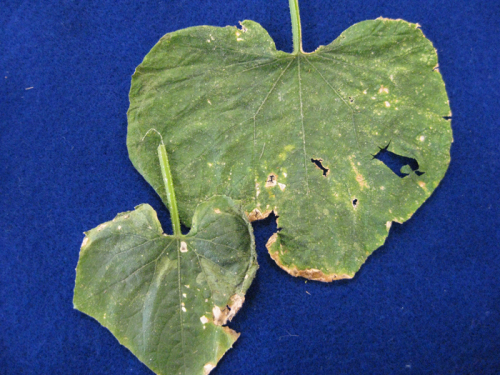 Angular leaf spot is a common bacterial disease of pumpkins and other cucurbits that causes chlorosis and necrosis (death) of leaf tissue. yellowing. Photo by Dan Carlson. Samples often present showing marginal chlorosis (yellowing) of the leaves. The combination of symptoms and the presence of the bacteria in the sample is indicative of a bacterial disease. Symptoms of angular leaf spot usually first appear as water-soaked lesions bound by the veins of the leaf, so they are angular in shape. As they progress, the lesions may turn yellow and then brown and the leaf tissue may tear. Lesions may have yellow haloes. During wet weather, bacteria may ooze from the spots and later dry to a white residue.chlorosis (yellowing) of the leaves. The combination of symptoms and the presence of the bacteria in the sample is indicative of a bacterial disease. Symptoms of angular leaf spot usually first appear as water-soaked lesions bound by the veins of the leaf, so they are angular in shape. As they progress, the lesions may turn yellow and then brown and the leaf tissue may tear. Lesions may have yellow haloes. During wet weather, bacteria may ooze from the spots and later dry to a white residue.chlorosis (yellowing) of the leaves. The combination of symptoms and the presence of the bacteria in the sample is indicative of a bacterial disease. Symptoms of angular leaf spot usually first appear as water-soaked lesions bound by the veins of the leaf, so they are angular in shape. As they progress, the lesions may turn yellow and then brown and the leaf tissue may tear. Lesions may have yellow haloes. During wet weather, bacteria may ooze from the spots and later dry to a white residue.chlorosis (yellowing) of the leaves. The combination of symptoms and the presence of the bacteria in the sample is indicative of a bacterial disease. Symptoms of angular leaf spot usually first appear as water-soaked lesions bound by the veins of the leaf, so they are angular in shape. 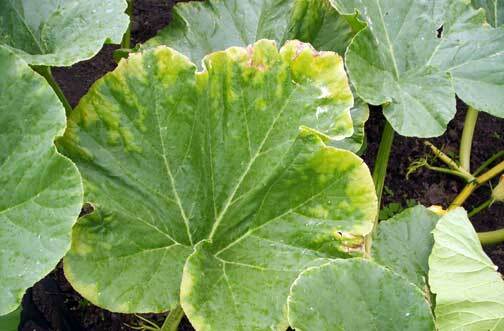 As they progress, the lesions may turn yellow and then brown and the leaf tissue may tear. Lesions may have yellow haloes. During wet weather, bacteria may ooze from the spots and later dry to a white residue. The bacterium that causes angular leaf spot, Pseudomonas syringae pv. lachrymans, can enter the leaf through the stomates (breathing pores), hydathodes (water-excreting pores on the edge of the leaf), or wounds in the leaf tissue. Angular leaf spot is favored by rainy weather and temperatures of 75 to 82 degrees F. High nitrogen levels also favor the disease. Angular leaf spot can be managed by using disease-free seed. Some resistant varieties of cucumber are available. Crop rotation helps to lower inoculum levels. Avoid handling plants when they are wet, and limit overhead irrigation. Copper compounds can be applied preventatively, before symptoms appear, and every 5-10 days during weather that favors disease. Insecticides may also be used to manage insect pests, which may cause wounds that serve as entry points for the bacteria. What is responsible for the yellow spots on my crabapple leaves?